Fact: pastels have attracted more myths than any other art medium. ‘They are incredibly fragile’, ‘the colours fade’, ‘only amateurs use pastels’, ‘pastel limits a painter’s artistic expression’, ‘it is no more than a sketching tool’ − the list goes on. However, they are all statements without any substance. So read on and learn the facts. We are all familiar with the ‘chalky’ substance known as pastel − many children use it as their first introduction to art creation − but what exactly is it? Renaissance masters, such as Leonardo da Vinci (1452-1510) and Michelangelo (1475-1564), used natural chalks for drawing, and it was from this that pastel developed. Originating in Northern Italy in the 16th century, it was produced from pure powdered pigments mixed with enough gum Arabic, fish or animal glue to bind them. Initially, pastel was only available in red, black and white − a far cry from today. There are now more than 1600 different hues and shades available, all of which claim to have an almost limitless shelf-life. When did Artists Start Using Pastel? First manufactured in the 16th century, pastel quickly found approval with many of the iconic masters of the day, including the German-born Hans Holbein the Younger (1497/8-1543), who settled in London in 1532 and received the patronage of Henry VIII. However, it was from the mid-18th century in Britain that pastel truly came into its own. At that time, members of affluent society deemed it the very height of fashion to have their images captured in ‘crayon painting’, as pastel was then called. 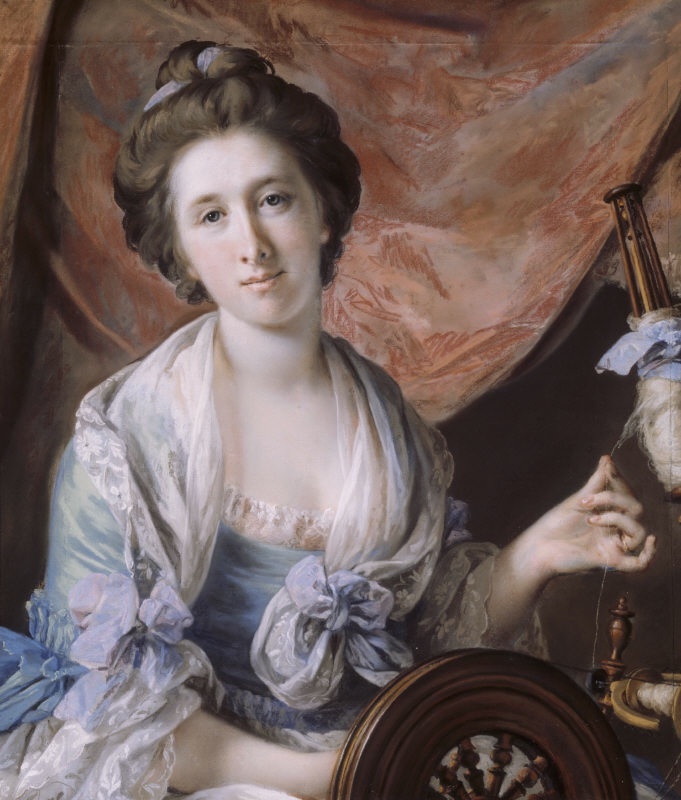 Leading exponents of the medium included names such as Daniel Gardner (1750-1805), John Russell, RA (1745-1806) and Francis Cotes, RA (1726-70), who is regarded as the father of English pastels. These artists could charge their clientele much the same prices as portrait painters working in oil. Fashions came and went and, by around 1820, pastel fell from favour. Sir Richard Colt Hoare (1758-1838), one of the great antiquarians of his day, considered pastel ‘quite unfashionable’. Few professional artists used it and it became very much the domain of the amateur. In some ways it is ironic that pastel has for so long been used by amateurs, because technically it is very difficult to master successfully. In the hands of a skilled exponent it is the most poetic and responsive of media. The suppression of pastels was relatively short-lived. In the late 1860s Edgar Degas (1834-1917) started to use it. 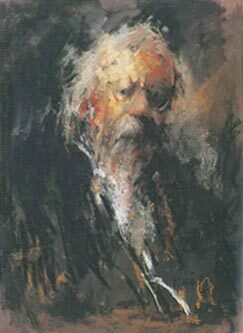 It is he who is generally recognised as having transformed the pastel from a sketching tool into a core artistic medium. It was not long before other greats such as Gauguin, Matisse, Monet, Renoir and Toulouse-Lautrec were using pastel with huge success. In Britain, pastel’s reincarnation came in 1888, when the first London exhibition devoted to the medium was mounted. Although the show was dominated by French examples, British art was represented by artists such as George Clausen (1852-1944) and Bernard Sickert (1863-1932). This event, coupled with a similar, much bigger show the following year, certainly inspired the art world - so much so that, in 1890, the Society of British Pastellists was founded. However, the Society’s inaugural exhibition was not well received by the art critics − The Times described some of the exhibits as ‘absolute jokes’. The demise of the Society came soon after. That said, pastel remained a favourite medium of many professional artists and, in 1898, the Pastel Society was born. It flourished, and today, with over 50 members, the esteemed Society continues to promote the very best. It is undoubtedly a major force in the growing awareness and appreciation of the medium. Throughout the 20th century leading artistic lights such as Augustus John (1878-1961) and Roger Hilton (1911-1975) have experimented with pastel. And this journey of discovery continues today. Some of Britain’s most revered artists use pastel − Paula Rego (b.1936), Peter Howson (b.1958) and Royal Academicians Diana Armfield (b.1920), Elizabeth Blackadder (b.1931), Bernard Dunstan (b.1920) and Ivor Abrahams (b. 1935) are but a small selection. There are numerous gifted and highly respected artists who use pastel, examples of whose work can be found in many commercial galleries throughout Britain. 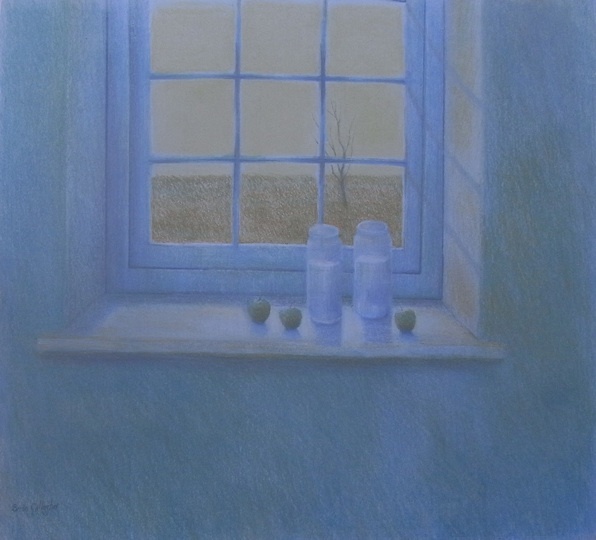 However, the medium’s showcase is unquestionably the Annual Exhibition mounted by The Pastel Society, which takes place in February at the Mall Galleries, London. This affords the opportunity to view several hundred very diverse examples by specialist exponents. Whatever one’s artistic taste, it is likely to be satisfied at this show. Careful examination of three unrestored pictures produced in the 18th century − one for each medium of oil, watercolour and pastel − is likely to reveal that pastel is the most permanent form of art available. The oil painting’s surface will exhibit cracks, while the colours and composition will be darkened due to two centuries of grime. As for the watercolour, the chances are that colour fading will have occurred due to sunlight. However, the pastel will still resonate its original colour tones. As with any work of art, old or modern, some care has to be taken. In the case of pastel, the most damaging consequence is damp as this can result in ‘foxing’ − small, rust-like spots on the paper. This tends to be more of a problem on old works because today’s professional artists use high quality specialist paper. All framed pictures benefit from being slightly away from the wall so that damp is less likely to build up. This can easily be achieved by gluing, say, a 2mm sliver of wine bottle cork to each bottom corner of the backs of frames. When it comes to framing, it is always prudent to pay for the best workmanship. Always request that Cotton Museum Board or Conservation Board are used for mounting. For expert advice contact the Institute of Conservation, 3rd Floor, Downstream Building, 1 London Bridge, London, SE1 9BG. Tel: 020 7785 3807. 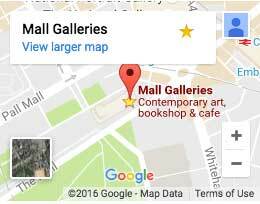 Their website, www.icon.org.uk, gives much useful information on the care of works of art on paper. The Pastel Society: Pastel Painting and Drawing 1898-2000, by Anthony J Lester and Ann Elliott, published by The Pastel Society, 2000. Lady Hoare (Frances Acland) (1735/36-1800) by Francis Cotes, RA, 1725-1770 at Stourhead. Second wife of Sir Richard Hoare, 1st Bt. Stourhead. The Hoare Collected (The National Trust), © NTPL/John Hammond. 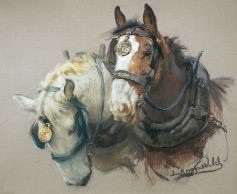 Shire Horses. 1928. Lucy Kemp Welch (1869-1958). Pastel 20 x 24ins. Reproduced with kind permission of Messum’s Fine Art. © David Messum Fine Art. 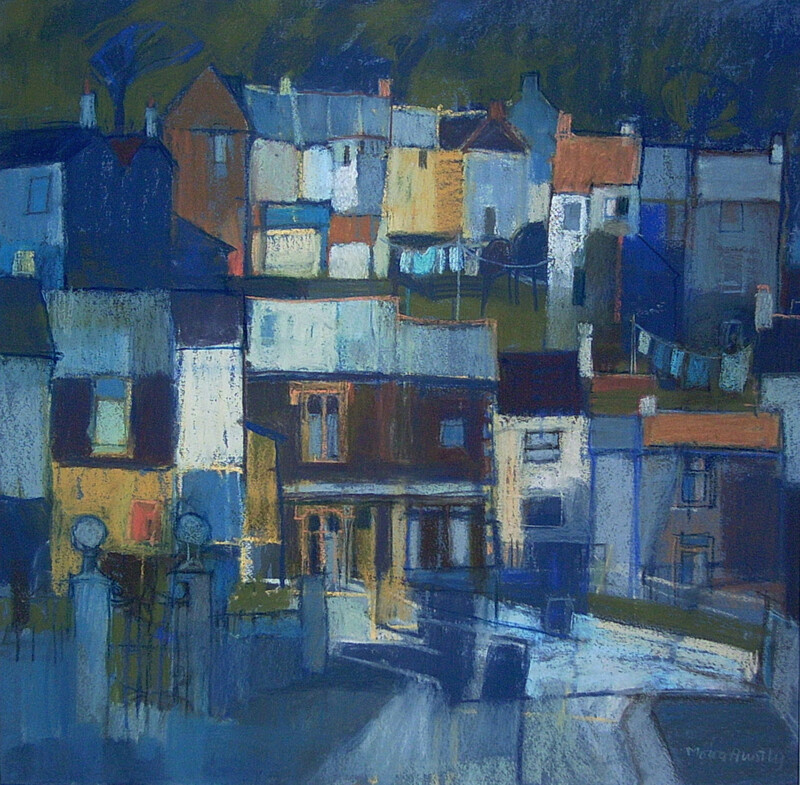 Tom Coates, Charlotte – work in progress, courtesy of the artist, © The Pastel Society. Moira Huntly, Abertillery, © Moira Huntly. Diana Armfield, Art Institute Chicago, courtesy of the artist, © The Pastel Society. Brian Gallagher, Autumn Days, © Brian Gallagher. Ken Paine, The Christian, courtesy of the artist, © The Pastel Society.